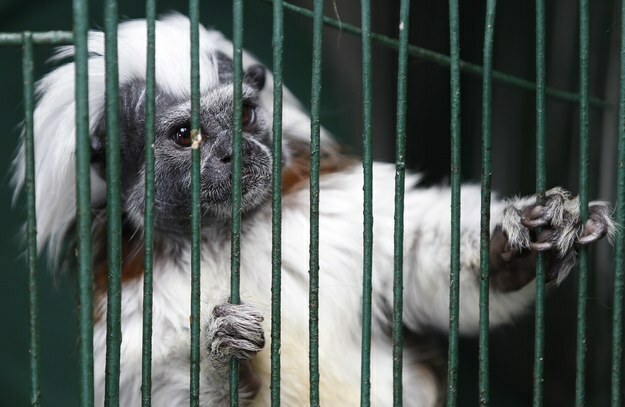 The cotton-top tamarins died after they were apparently “overlooked” and left out in the cold, officials said. Two cotton-top tamarins died last week after a keeper at the Alexandria Zoological Park accidentally left them outside. A third tamarin was able to survive the frigid temperatures after the band of critically endangered monkeys — which weigh less than a pound — were locked outside, city officials said. The monkeys — also known as cotton-headed tamarins — are among the smallest New World primates. Endemic to Colombia, they need temperatures of 76 to 85 degrees to survive. The high temperature on Jan. 7, when they were left outside, was in the 50s, with the overnight low in the teens, the Associated Press reported. The deaths of the two tamarins were only made public this week. It’s not clear how the monkeys were overlooked or if they had an outdoor “nest box” with a heating unit. In an email to the AP Tuesday, city spokesperson Cynthia Jardon said she couldn’t provide details because the investigation remained ongoing. She did confirm that the caretaker, who had been placed on administrative leave, resigned Monday. Any cotton-top tamarin deaths are a blow to the critically endangered species, which has been hit hard by the illegal pet trade and habitat destruction. In the late 1960s and early 1970s, it is believed that up to 30,000 cotton-top tamarins were exported to the U.S. for biomedical research, according to the International Union for Conservation of Nature. The current population is estimated to be about 6,000 in the wild, with just a third of them mature adults.